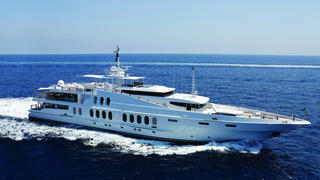 The 55 metre superyacht Oceana has had a central agency change and is now listed for sale with Burgess. Delivered in 1991, Oceana was built with an aluminium hull and GRP superstructure by Australian yard Oceanfast to a design by Jon Bannenberg. She has had several refits since, most recently in 2016. Accommodation is for up to 10-12 guests across five cabins. Her upper deck master suite is kitted out with a private observation lounge boasting panoramic views and a his and her's ensuite. Her exterior spaces include private balconies on the port and starboard of the main deck and a beach club-style sun deck equipped with a Jacuzzi. Her contemporary Bannenberg & Rowell interior combines a tranquil mix of whites accented with muted earth tones. Her 2016 refit included a complete repaint to her hull and superstructure and a rebuild of her engines and generators, taking her back to zero hours. Twin 3,480hp MTU diesel engines give her a range of 2,000 nautical miles at 12 knots and a top speed of 12 knots.